⌛MULTIPLE FUNCTION: The X-Chef Milk Pitcher can help you in a lot of ways. Froth or steam milk for lattes; measure liquids; serve milk or cream. 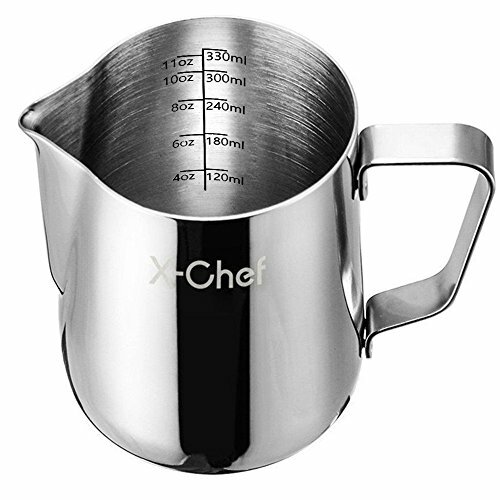 ⌛PROFESSIONAL QUALITY: The X-Chef Milk Frothing Pitcher is made of well polished #202 stainless steel, rust-proof, stain-proof and crash-proof, heat-proof, unbreakable by daily use. Right-handed design, you can see the measurement lines easily when pouring with your right hand. ⌛CONVENIENT: The simple design and dripless spout means no mess and perfect latte art. Very easy to wash, you can wash it under warm soapy water just in a moment;it is also dishwasher-safe. ⌛CAPACITY & MEASUREMENT: medium 12-ounce capacity(The measurement inside shows 10oz, but the actual capacity is 12oz if you fill it up), great to use at home or office for you and a couple of friends. Measurements inside makes it easy to read and measure liquids. ⌛QUALITY GUARANTEE & FRIENDLY CUSTOMER SERVICE: We have a commitment to every buyer 100% satisfaction. After all, we are customers, too, so if you have any problem about our X-Chef milk pitcher, just contact us for a satisfying solution. If you have any questions about this product by X-Chef, contact us by completing and submitting the form below. If you are looking for a specif part number, please include it with your message.